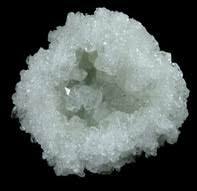 Datolite is a Calcium Boron Silicate Hydroxide that occurs in fine grained nodules found in old copper mine dumps. 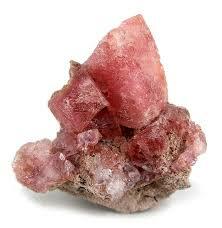 ​Datolite is a popular mineral among mineral collectors although it is somewhat obscure. It forms nicely faceted complex crystals. Datolite is mostly purchased as a specimen so cut and polished gemstones are rare. 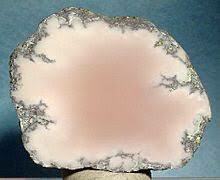 Datolite is coloured by iron oxide, copper and silver, giving a range of soft hues of pink, peach, red, green, and violet on a white opaque porcelain like background, sometimes with added lacy inclusions of copper of silver. 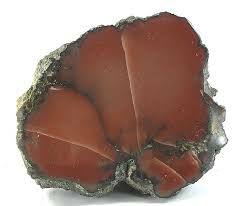 The lustre of this stone is vitreous to greasy, they are transparent to translucent. Datolite crystal habits include short prismatic to wedge shaped tabular crystals with complex and richly faceted terminations. The aggregates can be fibrous or granular. When using datolite for healing physical maladies you would benefit from placing a small specimen in a spiral bead cage and wear it as a pendant, so that you can receive the healing energies. ​You could also create crystal water and essence by the indirect method. Datolite is an aid to controlling and balancing insulin dependent diabetes. This stone will balance the glucose levels of people with hypoglycemia. It has been known to repair the nerve connections in the bodies nervous system. If you have physical addictions such as smoking, drugs, alcohol or additive food intolerances, datolite will enhance and assist you in controlling the side effects of, and desire for these substances. Datolite is a stone of love, acceptance and transition. This stone, particularly the red and pink versions bring love into your life, love of a partner, child, a soul mate or even a loving friend. These people will be attracted to you as the vibrations move through your aura outward bringing the people that you need in that time and place. Datolite teaches you that even though everything in you life is in upheaval, time passes and your life will calm down again. It also helps you understand that "every day in every way you are getting better and better". This stone will assist you during meditation, in finding a space whether physical, spiritual or emotional where you can be yourself and find comfort and peace, replacing fear and anxiety even if for only a moment until balance is restored in your life again. Datolite helps with problem-solving and also helps increase your memory, especially your ability to remember things that are important. ​Datolite is a problem solving stone that enhances study skills. It improves clarity for thought and deepens concentration, leading to an ability to remember fine detail where appropriate and teaching you how to discard the remainder. This stone facilitates mature thought and the flow of ideas. Green Datolite will connect your mind and body so that the past can be healed. It reviews in an unemotional way, emotional and mental trauma then ends any flashbacks you might have while healing them. It enables you to replace old worn out memories with new joyful ones. It increases your analytical skills especially for problem solving. 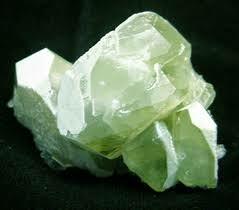 ​Green Datolite will help healers remove old traumas in the current life or past lives without absorbing the traumas themselves. Datolite has a strong connection to the Akashic Record and, placed on the third eye chakra, provides a download of karmic and historic information that may take time to process and integrate but ultimately shows the overall soul plan for all your lives. Datolite facilitates the retrieval of information encoded in the subtle DNA, connecting to ancestral patterns and events so that you understand why your family as it is, and facilitating healing of the past if appropriate.